This happens on a regular basis. 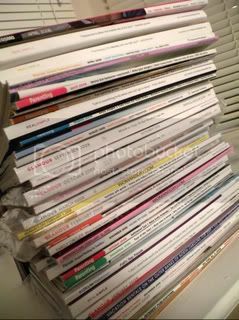 I just let my magazines pile up and don’t touch them. I do have a baby after all! I put “Go through pile of magazines” on my 7 in 7 this week not realizing just how many I have. I gathered them all together tonight (and I’m sure I’ll still find more later). This project just may have to carry over to next week! Notice that many are still in the plastic that they are mailed in! Never been touched.